Have you ever heard of electromagnetic resonance? If not, you’re about to, because it’s critical to your life force. It sounds a lot more complicated than it actually is. In a nutshell, back in the early 50s, a scientist named Winfried Otto Schumann discovered that the Earth emits radio waves. Nobody really thought much of it – not even the good doctor himself. Several decades later, another scientist named Hans Berger discovered that the brain emits electromagnetic frequency. He called them Alpha waves and invented the electroencephalograph, or EEG, to measure them. Of course, HIS research was a big deal! While looking through research, one of Dr. Berger’s colleagues came upon Dr. Schumann’s research, and as scientists do, they experimented and measured the Alpha waves of both the Earth and the human body and discovered that they’re the same – in other words, our bodies were designed to operate in harmony with our planet. Not so surprising to those of us who believe in the concept that we’re just part of a larger picture rather than a being separate from our environment. If you’d like to read about this in greater detail, check out this article. Now, how does this affect us? The better question is how doesn’t it affect us? We are energy. Many theories suggest that we’re composed of microscopic bits of energy vibrating on such a frequency that we appear solid. What’s absolutely been proven beyond a shadow of a doubt is that we emit electromagnetic waves, as does every other electrical device on the planet. From toasters to nuclear reactors, it’s emitting energy. Of course, most of us don’t have to worry much about nuclear reactors, but we do have to worry about cell phones, computers, laptops, TVs, electric wires, radio waves, lamps, fluorescent lights, toasters, microwaves, Wi-Fi, and anything else that has a cord. And some that don’t, anymore. Regardless of where you are right now, look around. How many objects are there within ten feet of you that resonate electrical waves; i.e., how many electrical or electronic gadgets are there in your space? What about when you walk outside? Power lines? Cell phone towers? Street Lights? Sunshine? Yup, they all emit some type of electromagnetic energy, and very few, if any, of them are operating at the same frequency that your body is. Now that you have a better understanding of what’s around you, let’s talk about one of our favorite products, Vital Protect Home. 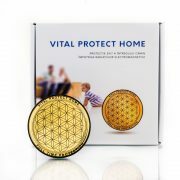 What Is Vital Protect Home? 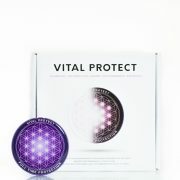 Vital protect Home is a device that emits electromagnetic waves that are the same frequency as the Earth – 7.83 hertz. This came to be known as the Schumann frequency. By emitting these waves throughout your home, they are protecting your own Alpha waves from being disrupted and thrown off frequency by the competing frequencies of all of the electronics in your home. Vital Protect Home is the product of our research team that studies cutting-edge, or “frontier” sciences; those that advance science as we know it. After studying significant experiments that indicate how vital maintaining the correct frequency is to human health, our group created Vital Protect Home. 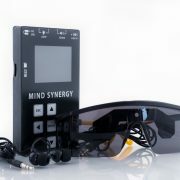 What are the Principles Behind Our Technology? 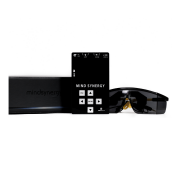 There have been numerous studies conducted on the effect of electromagnetic resonance on the human body, and solid links have been established. For instance, in the 1960s, Rutger Wever, a respected scientist and researcher from the Max Planck Institute in Germany, examined Drs. Schumann and Berger’s discoveries and expanded upon them to reach the hypothesis that if the human body is disconnected from the natural resonance of the Earth, health would begin to fail. To test this hypothesis, he conducted what’s come to be known as the Bunker Experiment. He built an underground bunker that was completely isolated from any type of electromagnetic resonance from the Earth. Then he accepted student volunteers, who agreed to stay in the bunker for several weeks. As he suspected, the results were undeniable. The subjects began to exhibit numerous physical and psychological problems such as anxiety, depression, and headaches. For the next phase of his test, unbeknownst to the students, he placed a Schumann generator in the bunker and, as he’d hypothesized, the symptoms either decreased drastically or went away altogether. To him, this was definitive proof that when the body is denied access to the electromagnetic frequency of the Earth, health fails. The opposite, correlating conclusion is that when the body is in direct contact with the Earth’s EMF, it stays in balance and well. This is just some of the research behind Vital Protect Home – it emits EMFs on the Schumann frequency, which protects you and your family from all of the competing frequencies present 24/7 in your home. Now that we’ve looked at all the research, let’s go back to all of those competing EMFs that we’re constantly exposed to – your laptop, cell phone, TV, microwave … and consider how much those frequencies are interfering with our natural connection to the EMF of the Earth. If all of the frequencies that surround us were audible, the discordant tones would make us crazy. Well, imagine that our bodies can actually hear them, and are reacting in a similar way. Research indicates that these EMFs that are different frequencies than our own, or those of the Earth, actually cause damage at the cellular level. They knock calcium ions, responsible for balance and calmness, among many other functions. They also disrupt potassium ions, which regulate brain function and blood pressure, and lithium ions, which regulate mental stability. Obviously, this level of disruption is bound to cut a wide swath in our health. It leads to chronic oxidative stress that diet and exercise alone can’t manage. EMFs actually cause damage at the DNA level. It’s no joke. Your health, and the health of your family, is in jeopardy just because you live in a modern world. We need the protection that Vital Protect Home offers more than ever. Most importantly, your body will be protected from the radiation emitted from your laptop, your cell, the powerlines outside your house, and all of the other competing, harmful EMFs. In short, you’ll be placing your body in a position to achieve and maintain optimal health. And in the end, what’s more important than that? If you have any comments about EMFs, or if you’ve used Vital Protect Home, please feel free to discuss your experiences in the comments section below. Share this post "Why Do We Need Vital Protect Home?"